The City of London Corporation finally won its High Court case to evict protesters from outside the St Paul’s Cathedral. This decision marks a symbolic end to the encampment that has risen in early autumn at the steps of London’s landmark church. But perhaps, it not the worst news for the Occupy movement. It is worth noticing that just few days ago police evicted another demonstration that has been residing in front of British Parliament for the last ten years - the antiwar protest, whose encampment dates back to pre Afghanistan times. The latter one have ceased to attract public interest and media attention ages ago. With the few old anti- war posters and half of the working tent it has became rather an act of desperation and a tourist curiosity rather than a serious political action. Easy to ignore, easy to dismiss. While Britain has been entering new wars flawlessly. Such an abrupt end of the St Paul’s protest (that follows the eviction of the camp in Zucotti Park in New York) might actually give the Occupy Movement new fuel for even more robust political action. In a way City of London Corporation could not pay the protesters a bigger favor. Occupy has attracted great media attention and inspired an important public debate - perhaps the most important in the West in a generation. Yet, no - one believed obviously believed that it had tools to reform current capitalism. So, when do you finish the protest when your goals cannot be met? What do you do when the cameras switch off? What do you do when the public is bored to death with the topic? 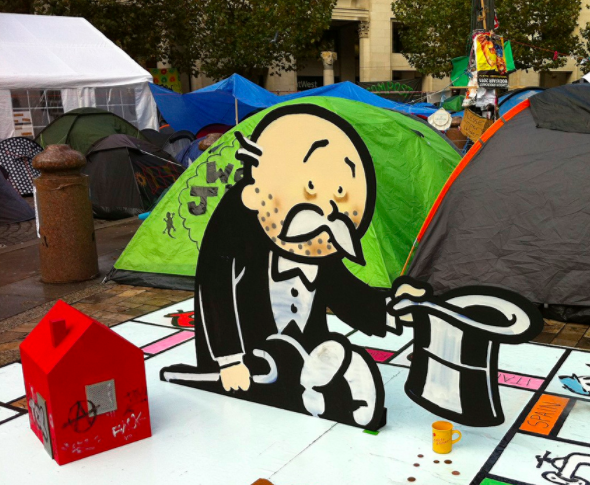 Occupy, like any other street protest, certainly risked loosing the momentum and just becoming a caricature of its own. Now, the forced eviction is a brilliant end to the protest. The sort of end that allows to call a moral victory! Now, in this very act of the romantic defeat Occupy can reinvent itself as new political force - as a new type of movement that joins in the debate using various global, grass - root ways of acting, switching in and off from places, spaces and threads of debate.The eviction from can actually serve as a great founding element for a lasting Occupy narrative. The decision to evict the protesters of the grounds of ‘becoming permanent’ serves also as important case in the debate about the right of the protest itself in the democratic society. This week’s decision of High Court brings the certain limit to citizens rights to protest. Certainly in the UK. So, one must ask today - when do we have the right to protest? Only, when it does not disturb anyone? When it allows to continue with the business as usual? I used to think that it was in the very nature of the protest to bring the disturbances. But the Daily Mail summed it up for me today: ‘If protesters demonstrate for responsible capitalism, they should be also ready to protest in a responsible way’. Point taken. Next time protesters should also stop displaying poverty and dress more nicely so it does not disturb the right - wing press aesthetics.